It goes without saying that a book about religion might become a literary flashpoint. The displeasure generated by publication is usually inversely proportionate to the passion that motivated the author in the first place. However, this is not a no-win situation as long as either the author or the objector comes down on the side (or at least close to the side) of truth. A post-modern example of a literary disturbance is the reaction in 1988 to the publication of Satanic Verses by British author Salman Rushdie. Claiming the book blasphemed Mohammed, the Iranian Ayatollah Ruhollah Khomeini issued a fatwā in 1989 that included a bounty on the author's life. 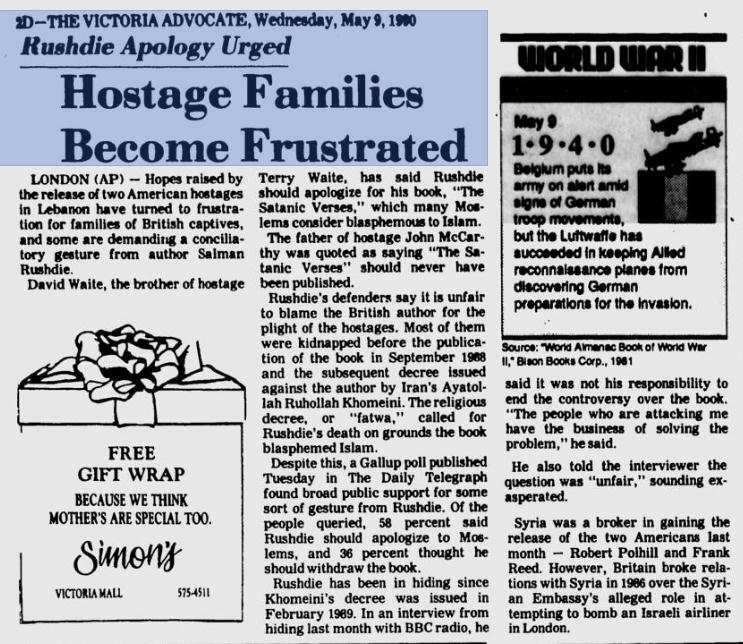 Families of the hostages during the Iranian hostage crisis blamed the abductions of their loved ones on Rushdie. Despite an apology* from Rushdie in 1990, the bounty still stands today. Michael Molinos—Spanish theologian born in 1627; in 1675 published The Spiritual Manual which offended a Cardinal. [He] was conducted in his priestly robes to the temple of Minerva, where he was bound, and holding in his hand a wax taper was compelled to renounce sixty-eight articles which the Inquisition decreed were deduced from his book. He was afterwards doomed to perpetual imprisonment. On his way to the prison he encountered one of his opponents and exclaimed, "Farewell, my father; we shall meet again on the day of judgment, and then it will be manifest on which side, on yours or mine, the Truth shall stand." Bartholomew Carranza—In 1558, published a catechism and was accused of Lutheranism. [He] was speedily conveyed to the dungeons of the Inquisition at Valladolid. For seven long years he lingered there, and was then summoned to Rome in 1566 by Pius V. and imprisoned for six years in the Castle of St. Angelo. The successor of Pope Pius V., Gregory XIII., at length pronounced him guilty of false doctrine. His catechism was condemned; he was compelled to abjure sixteen propositions, and besides other penances he was confined for five years in a monastery. Broken down by his eighteen years' imprisonment and by the hardships he had undergone, he died sixteen days after his cruel sentence had been pronounced. Jerome Wecchiettus—A Florentine doctor of theology whose book was burned in 1621 by the Inquisition. He was condemned to perpetual imprisonment. Samuel Clarke—An English author who "was very intimate with the scientific men of his time, and especially with Newton." In 1712 he published a work which was "declared to be opposed to the Christian belief and tainted with Arianism." Clarke got off lightly; he just lost his job as chaplain to Queen Anne and Rector of St. James's. Francis David—Published a book, De Christo non invocando; condemned as an "impious innovator and preacher of strange doctrines." He was cast into prison, where, in 1579, he died. Antonio de Dominis—An Archbishop "learned in history and in science, ... the first to discover the cause of the rainbow, his explanation being adopted and perfected by Descartes." In 1617, he published a work in three volumnes condemning certain actions and beliefs of the Roman church. The Inquisition seized him, and he was conveyed to the Castle of St. Angelo, where he soon died, as some writers assert, by poison. His body and his books were burned by the executioner, and the ashes thrown into the Tiber. Noël Bède—Wrote a work abounding in "vehement criticisms and violent declamations" against Erasmus, denouncing him as a heretic. Erasmus did not fail to reply to his calumniator, and detected no less than eighty-one falsehoods, two hundred and six calumnies, and forty-seven blasphemies... Bède continued to denounce Erasmus as a heretic, and in a sermon before the court reproached the king for not punishing such unbelievers with sufficient rigor. The author was twice banished, and finally was compelled to make a public retraction in the Church of Notre Dame, for having spoken against the king and the truth, and to be exiled to Mont- Saint-Michel. William Tyndale—Translated the Bible into common vernacular. Translators of the Bible fared not well at the hands of those who were unwilling that the Scriptures should be studied in the vulgar tongue by the lay-folk...but it may be noted that his books, rather than his work of translating the Scriptures, brought about his destruction. For sixteen months he was imprisoned in the Castle of Vilvoord, and we find him petitioning for some warm clothing and "for a candle in the evening, for it is wearisome to sit alone in the dark," and above all for his Hebrew Bible, Grammar, and Dictionary, that he might spend his time in that study. After a long dreary mockery of a trial on October 16th, 1536, he was chained to a stake with faggots piled around him. "As he stood firmly among the wood, with the executioner ready to strangle him, he lifted up his eyes to heaven and cried with a fervent zeal and loud voice, 'Lord, open the King of England's eyes!' and then, yielding himself to the executioner, he was strangled, and his body immediately consumed." John Huss—Wrote De Ecclesiâ, in which he "maintained the rigid doctrine of predestination, denied to the Pope the title of Head of the Church..."
His plain speaking aroused the fury of his adversaries, and he knew his danger...When at last he was granted a safe conduct by the Emperor Sigismund, and trusted himself to the Council of Constance, his fate was sealed. Even in his noisome prison his pen (when he could procure one) was not idle, and Huss composed during his confinement several tracts on religious subjects. At length his degradation was completed; a tall paper cap painted with hideous figures of devils was placed upon his head, and a bishop said to him, "We commit thy body to the secular arm, and thy soul to the devil." "And I," replied the martyr, "commit it to my most merciful Lord, Jesus Christ." 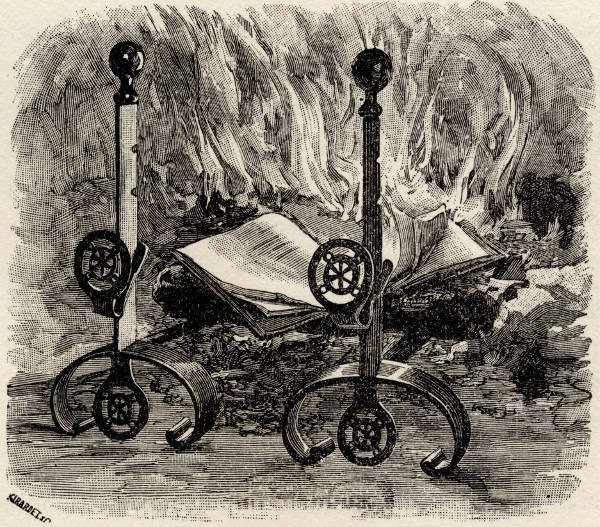 When on his way to execution he saw his Fatal Books being burnt amidst an excited crowd, he smiled and remarked on the folly of people burning what they could not read. Although a Roman Catholic, he favored Protestant views, and did not show much love for either the monks or priests. 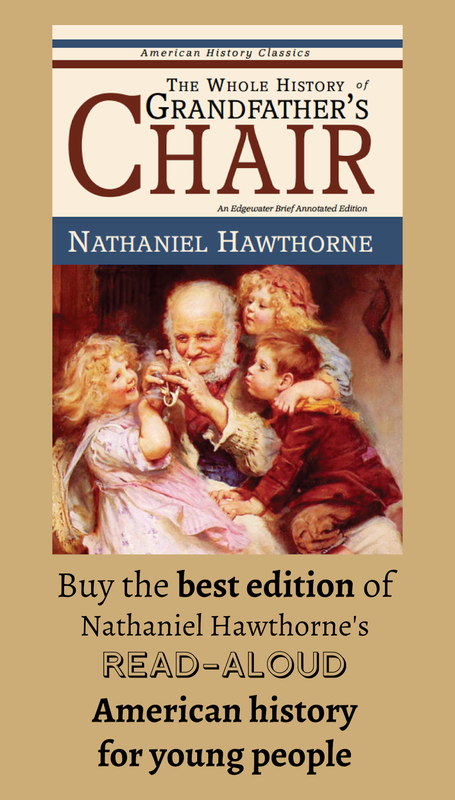 His bold comments attracted the attention of the Inquisition, who condemned his work and placed it on the Index. The author was condemned to death by hanging, but happily for him powerful friends interceded, and his punishment was modified to a two years' banishment. He died in 1555, when Protestant burnings were in vogue in England. Enzinas—Author of a Spanish translation of the New Testament. But it caused him to be imprisoned fifteen months. Happily he discovered a means of escape from his dungeon, and retired to safe quarters at Geneva. Louis Le Maistre—Imprisoned in the Bastille for his opinions and for his French translation of the New Testament, published in 1667. Savonarola—A famous Florentine preacher during the Renaissance, who wrote books filled with "bitter invective" denouncing vices of the Pope and Cardinals. 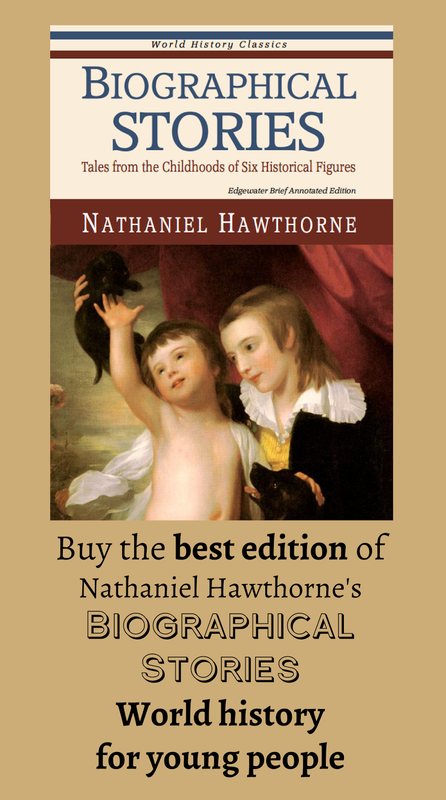 Endowed with a marvelous eloquence, imbued with a spirit of enthusiastic patriotism and intense devotion, he inveighed against the vices of the age, the worldliness of the clergy, the selfish ease of the wealthy while the poor were crying for bread in want and sickness. The good citizens of Florence believed that he was an angel from heaven, that he had miraculous powers, could speak with God and foretell the future; and while the women of Florence cast their jewels and finery into the flames of the "bonfire of vanities," the men, inspired by the preacher's dreams of freedom, were preparing to throw off the yoke of the Medicis and proclaim a grand Florentine Republic. The revolution was accomplished, and for three years Savonarola was practically the ruler of the new state. The austerity of his teaching excited some hostility against him, especially on the part of the monks who did not belong to his order—that of the Dominicans....In addition the friends of the Medicis resented the overthrow of their power, and the populace, ever fickle in their affections, required fresh wonders and signs to keep them faithful to their leader. The opportunity of his enemies came when Charles VIII. of France retired from Florence. They accused Savonarola of all kinds of wickedness. He was cast into prison, tortured, and condemned to death as a heretic. Michael Servetus—Spanish author who studied law and medicine. *Rushdie later retracted his apology.